The 400 Divisadero team is excited to join the Divisadero community. We strongly believe in supporting our neighborhoods, and look forward to seeing you at one of the events that we will be sponsoring. Please check back for updated information on events and sponsorships. The mission of Art on Site SF is to create community connection through public art. Our hope is to generate positive impact, cultivate connection, uplift local communities, celebrate diversity, and heal both individuals and society. 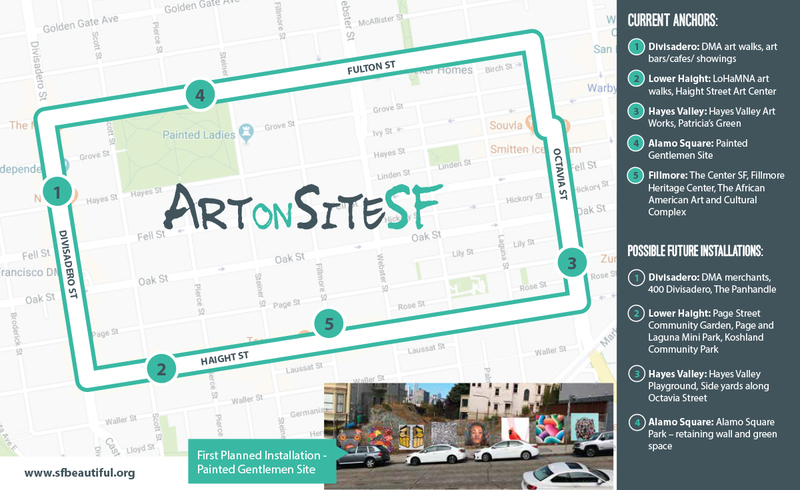 Co-founded by Genesis Development, Art on Site SF is a volunteer art collective based in the heart of San Francisco: Alamo Square, Divisadero, Hayes Valley, the Fillmore, Lower Haight and NoPa. The Painted Gentlemen is the first Art on Site SF installation. Our art manager for Art on Site SF, fnnch, hand-picked each artist. His wish is to offer a variety of voices and styles, each making a legitimate attempt to be impactful. Murals will rotate every 6 – 9 months. If you are interested in being considered for a future rotation, please email painted.gentlemen@fnnch.com. We have many more exciting projects in the works! Tag your photos #ArtOnSiteSF for a chance to be featured. You can follow along at @ArtOnSiteSF on Instagram. If you wish to participate with Art on Site SF by having an art installation, volunteering or donating, please contact our fiscal sponsor, SF Beautiful at www.sfbeautiful.org. Art on Site SF is also sponsoring a community Yoga program. Learn more about the murals at The Painted Gentlemen from fnnch. If you or your neighbors have children, the Museum of Future Sports (MoFS) and Boys & Girls Club of San Francisco invite youths of all ages to attend a Build, Fly & Keep! 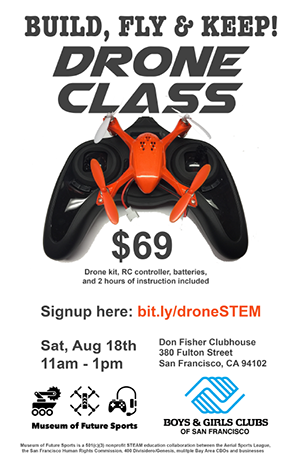 Drone Class on Saturday, August 18 from 11am -1pm at the Don Fisher Clubhouse (380 Fulton Street). Download the flyer to learn more. 400 Divisadero/Genesis Development co-developed this fun program as a founding member of MoFS to inspire and provide access to STEM FOR ALL. Students will learn the basics by building their own micro-drone from scratch, with hands-on help and guidance from MoFS professional pilot instructors. Students then learn to fly with one-on-one training, starting with basic hover-and-land skills to more advanced techniques. The drones weigh about one ounce and are very safe to operate. Space is limited and attendance is based on first come, please click here to register now! Registration includes admission for the participant (minimum age 8, 10+ suggested). All equipment needed to operate the drone including battery and charging equipment is included. Genesis Real Estate has funded workshops at the following Community Benefit Organizations: Booker T Washington Center, Boys & Girls Clubs of San Francisco, Collective Impact, Hamilton Families, Mo MAGIC, United Playaz and West Bay Pilipino Center. The cost to attend the class is $69; however, 400 Divisadero/Genesis Development is committed to improving tech literacy for San Francisco youth and is offering need-based scholarships – all you have to do is email luis.cuadra@400divisadero.com with the name, age and contact information Genesis Development will take care of the rest. In order to ensure a high-quality experience, this workshop is limited to 18 participants. Please let us know if you are interested in future workshops, as we likely will fill-up fast. Stay tuned for future STEM FOR ALL initiatives for the children of San Francisco. We are open to opportunities for small grants supporting the neighborhood. Examples include community engagement events, educational forums, creative workshops, art installations, greening/beautification projects, etc.